I picked this up this week and got to use it on a project today. I needed to cut dado’s that were just under 1/4” (the smallest my dado stack will cut) in MDF. I made some test cuts first, and the bottoms were as dead flat as I had hoped. 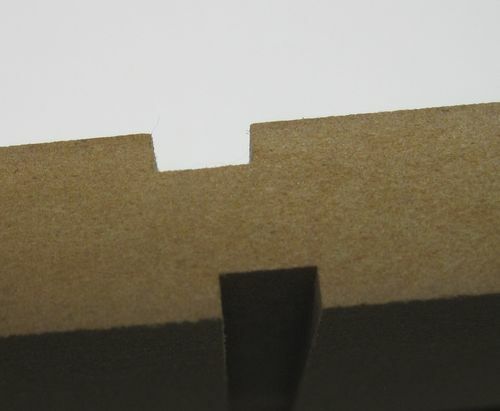 Here is a photo of a double pass to create a 7/32” dado in both sides of a piece of scrap MDF. The kerf was exactly 1/8” for a single pass. I was very pleased with the quality of the cut. This will be my go-to blade for cutting splines as well. The cost was on par with other Forrest blades ($119) at my local Woodcraft. I own several Forrest blades, and this another quality product from them. I have one of these in my “forrest collection” as well. I will say mine does not yield this flat of a cut. Although I have not used it since I sent it to forrest for resharping. The blade cuts well however, just not as flat as what yours is in the pic. Thanks for the review. I’ve never seen a Forrest blade get less than 5 stars in a review. That tells you something about how great those blades are! I too have the WW II. However I have the 48 tooth blade. My first cuts where not what I expected but I think my expectations were too high. Since then I wouldn’t trade it for any other! Great blade! Welcome to yet Another 5 STAR worthy tool review on Lumberjocks !! ”Just used it for the first time , it was able to cut MDF , and only cost $120.00” ! I have had this blade for a while, and am very pleased with it. It cuts just as nice and flat as in the images that Lee posted. I bought it mainly for joinery: box joints, rabbets, dadoes, tenons. And for you SawStop people, Forrest will attempt to fix your blade if the brake fired. I ran into my aluminum part of my miter gauge (‘had taken too long of a brake from woodworking! ), some teeth were damaged, and Forrest fixed it and sent it back promptly.